4 Steps To Plan An Oktoberfest Bachelorette Party Online For Fun! 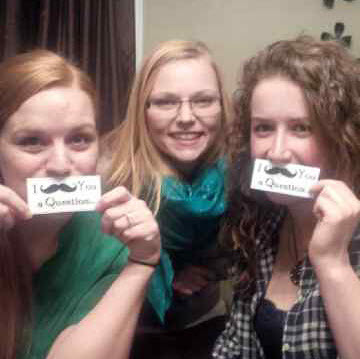 There is never enough girl time! 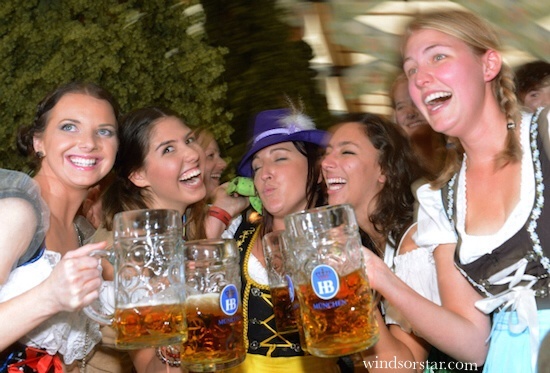 Girls just want to have fun and since it’s the season, an Oktoberfest get-together with the girls in your wedding party plus more is a great reason to have some laughs and celebrate German traditions. This is a great opportunity to take an already fun atmosphere and theme, mix it with your friends and produce a bachelorette party all will remember and speak of for years. It’s about creating memories connected to you and your wedding and bringing people together to celebrate your upcoming nuptials. Party planning doesn’t have to be a tedious task these days with new technology at your fingertips and a little creativity. With photo-sharing website features, innovative video technology, social media marketing capabilities, RSVP options, ticket & merchandise sales and more, you can quickly and easily create an online invitation for a girls’ night out that will entice and build excitement for all those involved! 1. Simply gather up photos from past Oktoberfest occasions or get the girls from your wedding party together with hats and mugs of beer and take some fun shots doing your own Oktoberfest photoshoot. 2. Consider adding a personal video feature! Prepare a short video script you can use as a pop-up for your invitation; use some props and consider playing some Wunderbar music in the background. Feeling a bit shy?.. No problem… add a Youtube chicken dance video! 3. Fill in the party details in the template provided. 4. Share your invite through email or social media channels of your choice! Creating your online party invite is just a click away. Start now! The excitement is building. You’ve told your parents and best friend of your engagement and you’re now excited to let those know who will participate in and be witnesses to your wedding. Choosing those in your wedding party can be the easiest decision for some couples, yet the most frustrating, nerve wrecking experience for others. We’ve come up with a few tips in choosing your wedding party. We hope you find them helpful. 1. Make it a joint decision. The first thing to do is to sit down as a couple and write a list of people you are both considering for the honor. 2. Decide on your preferable number of attendants. Does your fiancé have more people he or she simply MUST have in the wedding party than you? Gone are the days of needing to have six groomsmen for six bridesmaids. Matchy match isn’t the key. The bride’s best friend might be named Richard or the groom might choose his sister to stand at his side. Your choice might not be typical but it’s all good. 3. Consider residence of attendants. Keep in mind that if your wedding will not be happening for a while circumstances might change and someone you are close to right now like a college roommate might be living afar by the wedding date. If you share an unbreakable bond that doesn’t need to be a barrier. With smart phones, Skype and FaceTime, anyone can take an active part in wedding planning. It just means an extra city to find shoes in! She might want to be a bridesmaid instead of the maid of honor though so she’ll have fewer responsibilities. 4. Consider relationships of attendants to you. Sometimes it is a given that all siblings will be asked to be in the wedding party and sometimes not. Are extended family and friends being considered? Did you always plan to have your BFF from kindergarden be in your wedding but you haven’t seen them for a few years and they really don’t know you anymore? Who do you feel closest to? Who do you both feel closest to? Who knows you the best for the person you are today? What will be the reaction of those not chosen? You might need to open a bottle of wine for this one. 5. Consider relationships between attendants. Being aware of relationships between the people in your wedding party is smart practice. Knowing that there will be times where all will need to work together (like pre-wedding parties etc. ); it is nice to know that those chosen will be able to do so effectively. Read our blog on encouraging bridesmaid bonding. 6. Decide if you are considering having children involved. Little ring bearers and flower girls are real crowd pleasers. Be prepared to be upstaged a little. You can control what they wear but not what they do or say! That’s what makes them fun…maybe. Consider what age they will be at the time of your wedding and if it will be the look and feel you’re after. 7. Consider special talents of attendants you’re considering. Make a list of what you will need and expect from your bridal party. Most maids of honor plan a shower and a staggette. In Canada, it is quite common for the wedding party to host a “Stag ‘N Doe” which is a pre-wedding party with food, dancing and ticketing where the money is collected and donated to the couple for their future together. Hopefully some of your attendants will have great organization skills but even if they don’t the cool thing is that you can let them use your Eventastic website to help plan the events! 8. Are you considering having a pet involved? Always dreamed of having your dog take part in your wedding? Why not? Some people have even included their fish or horse in a unification ceremony! 9. How to deal with conflict. Chances are you will be urged to include a person in your wedding party that you are not close to. It’s your day and it’s your right to take a stand but first ask yourself if making this concession will lead to a more peaceful life in the long run. Be up front about it. “I’m a little worried about how we will get along during this process” and “Do you think we can work together to make this wedding fun?” are questions for discussion. 10. Be fair. Reserve the right to have the Maid or Matron of Honor be your first choice. When it comes right down to it, who do you want standing beside you handing you tissues during the ceremony? (and possibly holding your hair later in the evening? :)) Likewise, Best Man might be best chosen by the groom. Keep an open mind, open heart and be conscious of your fiancee’s feelings. Choose people that are loving, supportive and reliable. A wedding can go off without a hitch with just a Maid of Honor and a Best Man. That might be the solution if it’s simply impossible to narrow down your list. As a general rule though, a larger wedding can use a larger wedding party to spread the work around… and the fun of course, don’t forget the fun! This experience motivated me to come up with a helpful list of emergency items to have available on the wedding day. These are some items I think would seem important to have close at hand for the big day in case of need. Your wedding party in its entirety should be aware of where this emergency kit can be located at any time. Sometimes a quick fix is all it takes to ensure a situation is under control and avoid it leading to something bigger. Feeling and looking great on your wedding day is very important. It’s nice to know your wedding party has your back at all times to assist with the look and feel that is crucial to your special day. Yes… My mom taught me to always be prepared! Eventastic Weddings wishes you a great day! Deciding on who will be in your wedding party isn’t always easy. Perhaps you don’t know who to select or you are limited on the number you can choose based on the other half. Once you get over the hurdle of deciding who you want in your wedding party you still have to ask them. It is still common to just come right out and ask but it is becoming trendy to ask your wedding party in a creative, memorable way. How you go about asking your party all comes down to how much time and money you would like to invest into the act of asking and how important it is to you in the grand scheme of things. 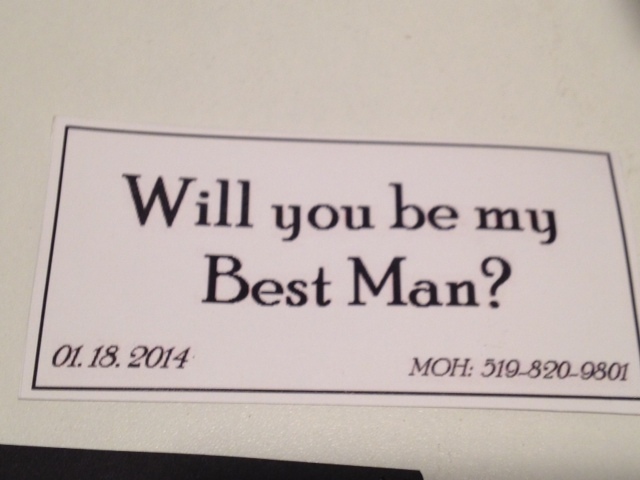 Now it’s your turn to pop the question! There is no shortage of ideas floating around the internet of creative ways you can ask your wedding party. In addition to the pinterest board we’ve put together of our favourite ways to pop the question, I thought I’d share with you how I did it because obviously I think it is hilarious and adorable. I made the same cards for both the groomsmen and bridesmaids which saved me time and money since I didn’t have to get additional supplies but also meant that I had to do something that was gender neutral. I printed my message on white paper and glue both sides together. I would suggest doing the final cut after gluing sides together to get a perfect straight line. Using a heavy book I created little envelopes, glued the edges and let them dry under the weight of a book. Then I used the design cut out to fancy up the envelope. Finally I addressed them using a metallic marker and voilà! 9 cards, a few supplies and about 4-5 hours of hands-on work. The pictures made it all worth it! Let us know how you asked your wedding party! Asking your wedding party is a milestone in your wedding planning and something you can share on your wedding website blog to keep the family updated and introduce your newly ordained wedding crew. With this task behind you, let the planning begin. You officially have your committee to guide and help you create the wedding of your dreams! 10 Theme Ideas for a Bachelorette Party! Eventastic has made it easy for you and your bridal party to plan pre-wedding parties with its cool event planning tool and what better way to have some fun with family and friends AND make some cash towards the wedding than to have a Bachelorette Party! A ‘Bachelorette Party’, sometimes called ‘Stagette Party’ is a party for a woman planning to get married. In the United Kingdom and Ireland the term ‘Hen Do’ or ‘Hen Night’ is commonly used while in Australia and New Zealand it is a Hens Party or Hens Night. Modeled after the ‘Bachelor Party’ where the groom throws a dinner for his groomsmen and parties through the night before his wedding, women get together and have a night out to mark the bride-to-be’s passage to the next stage of her life. Bachelorette Parties come in all shapes and sizes. Usually hosted by the bridesmaids in the wedding. It is up to them to do up an invite, monitor responses, collect monies and take charge the night of the party. That can often seem like quite a large task but given the right tools, as you have with your wedding website, your event planning tool will make this Bachelorette Party easy to organize by simply filling in the provided template. 8. Bunny Party – Get out the pink ears and wow the town! 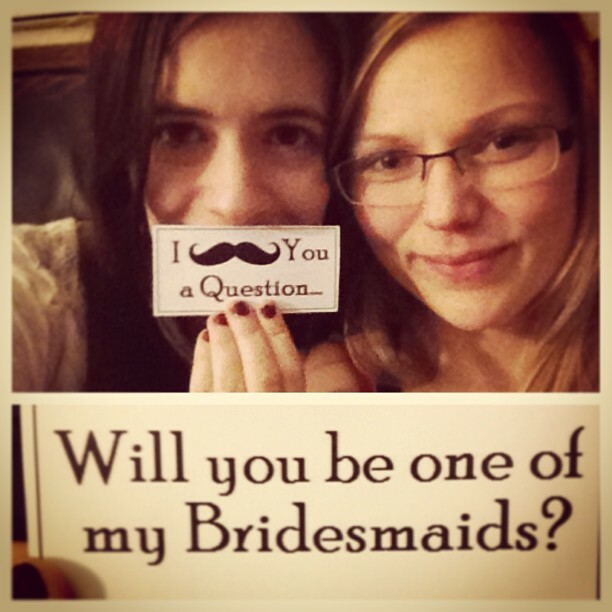 Eventastic Weddings has made a Pinterest page of some of our favourite Bachelorette Party ideas. Click here to view. Cheers! Let’s face it, while the fertility statue from Fiji that your Mother-in-law is thinking about giving you as a wedding present would be, um, interesting, you’d really rather have the cash. Eventastic has tons of non-gift related features to make your wedding planning a snap but probably no other single feature will be as useful as the cash gifting option. As you’ll see , asking for cash gifts is easy and it will be fun & satisfying for your guests. With Eventastic you can choose to have cash gifting in conjunction with a wedding gift registry with items from any store anywhere or you can convert your wedding registry to cash gifts only. When you set up your cash gift registry, if you wish you can leave a general message to set the tone and also an individual message explaining each cash gift item that you have listed. This way people will understand each request on a personal level. If you are having a larger wedding make sure you add a lot of ideas thus giving guests greater choices. They’ll wish they had an option like this when they got married! Many couples getting married nowadays are already well set up with household items but they could use a hand with the cost of other things like putting in those hardwood floors or new counter tops. You could even have guests contributing towards a down payment for your first home together, honeymoon or home renovations. If this is a second marriage you could put money towards a larger home for your blended family or list a registered educational savings plan for your children’s future! Cash gifts are a great option for destination weddings where gifts just aren’t practical. Your guests could contribute towards honeymoon activities like hang gliding, a day at the spa or extending the vacation. No matter what kind of honeymoon you have planned you can cash out early and use the money for your trip. If you are feeling particularly blessed consider stating you will give a portion of the cash gifts to a charity that is dear to your heart. Remember that even if you choose to have a cash only main wedding registry, you can have other individual gift registries on your site for other wedding events like showers. The possibilities are virtually unlimited and cash given this way could not be more personal. Your guests will be pleased to know they are giving what you really want, making it a wonderfully meaningful gift. They will have a real sense of pride and ownership in making your life together the happiest it can be. Wedding showers are some of the most exciting pre-wedding parties that entail gift giving in anticipation for the big day. Wedding showers are usually hosted by friends, family, workmates etc, bringing various groups of people together for fun, nibbles, memories, gift giving and celebrating of the wedding day to come. It is not unusual for there to be multiple showers planned within a couple months of the wedding. There are a few aspects of shower planning that brides can and should be involved in to help with its overall success. We at Eventastic Weddings have a few tips on wedding showers for you to ponder in terms of preference and then share with your wedding party or those most likely to host. 1. What type of shower do you prefer? In the past, wedding showers were actually bridal showers where only the bride attended with those throwing/attending the party and the groom/fiance’s job was to arrive at the end and start hauling out all the gifts to the car. Today times have changed and now it is not unusual to have couple’s showers where both attend and enjoy the festivities. It’s a good idea to let your friends and family know your thoughts and preferences whether traditional or not. 2. Do you have a particular theme you wish for? It is always fun when showers are hosted with a particular theme in mind. Often themes are chosen taking into consideration the bride or couple’s interests and likes or trying to capture a particular mood or feeling. Themes range from “Garden Party” (guests sip on tea or martini’s in a beautiful garden setting) to “Spa Party” (guests enjoy time together having facials or mani/pedi) to “Candy Party” (where every kind of candy is displayed in interesting ways for all to sample) to “Glamour Party” (where each guest is given a colourful boa as they walk the red carpet). If you have a particular theme wish now is the time to share it. 3. What are your thoughts on venue? Your shower may take place in a beautiful garden either public or private, or be planned in someone’s home or even at the office. It may occur at the retirement home making it easy for grandma to attend or at a hall depending on numbers being invited. If you know of relatives and friends that would want to attend one of your showers but have special requirements because of disability or otherwise now is the time to let those most likely to plan know. 4. Do you have food preferences? Food for showers sometimes will involve a meal but most often it is an afternoon of great nibbles, both sweet and otherwise. If you totally dislike or have developed allergies/sensitivities for certain foods now is the time to make that known. Shower hosts might ask various people to contribute to a potluck style of gathering or even arrange to have it catered and the last thing you need is hives or upset stomach at the end of the day. 5. What are your thoughts on games? Shower planners often arrange to have party games played at the shower to keep the mood happy and lively as well as assist everyone in mingling and mixing. There are endless options to be played. Have you heard of the toilet paper bridal gown and veil game? Guests are divided in groups and asked to pick one person from their group to don the wedding ensemble made out of toilet paper. If there is a shower you’ve attended in the past and loved playing a game or found it effective then this is the time to share ..or…if you dislike all games at showers you might want to mention this. 6. Have you started your shower registry? At this point you have had some time to peruse your free wedding website and no doubt are thrilled with having your universal gift registry option. Any item from anywhere can be added to your wedding registry from surfing the net on your computer AND by using Eventastic Weddings APP downloadable through any APP store for any smartphone. We suggest that you make not only your “Wedding Registry” of items for your guests to see but ALSO one or multiple “Shower Registry” lists. Shower registry items would typically be items that are lower priced or group buy options. Have fun uploading all your shower pictures to a “shower album” on your wedding website for everyone to enjoy! That’s the ticket to easy event planning! Relax and Enjoy: You might think that there is no time for relaxation with all the planning and work that goes into making sure your special day is indeed special. But pre-wedding parities and showers are a perfect time for you to sit back and savour the moment of just being with your friends and family. After all, they are coming together to wish you the best in your life for you and your fiancé. Bachelor and Bachelorette Party Ideas: Here are some fun and exciting Bachelor and Bachelorette party ideas for your last night out before you get married! A spa weekend, wine tour, ski or snowboarding trip, visit a psychic together, bungee jumping, going to a night club and of course the typical Vegas trip! Planning Pre-Wedding Parties: One of the great things about getting married are all the pre wedding parties your wedding party, friends and family will throw for you to help raise money to put toward your life together. Popular events such as engagement parties, bridal showers, Stag N Does and bachelor and bachelorette parties are just some of the fun events you will get to experience. Eventastic Weddings has this amazing function that allows the “party planners” to plan an event without the hassle. Save time and money by selling more tickets for your Stag N Doe or any pre wedding party directly on your own wedding website with our easy to use ticketing function. Your guests will have the convenience of purchasing their admission, drink and game tickets right online. You will have a centralized location for all your event details, such as date, time, gift registry and ticket sales. Video invitations, RSVP’s and thank you’s will also certainly be helpful options in your wedding preparation and followthrough.Your friends, family and guests will appreciate the ease of going on your wedding website where all your wedding details may be viewed. We hope our tips are informative and helpful for you and your fiancé during this amazing journey.